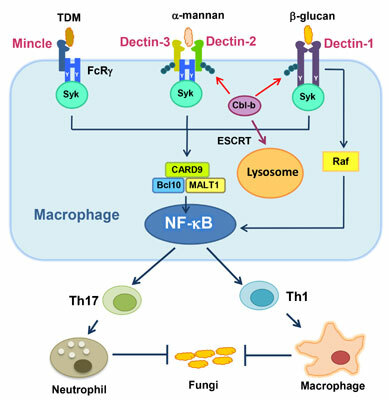 During the last two decades, C-type lectin receptors (CLRs) have been demonstrated to play key roles in initiating the host immune response against fungal infection. It is well established that CLRs, such as Dectin-1, Dectin-2, Dectin-3 and Mincle recognize the cell wall component from the infected microorganisms by using their carbohydrate recognition domain (CRD). Upon stimulation, CLRs induce multiple signal transduction cascades through their own immunereceptor tyrosine-based activation motifs (ITAMs) or interacting with ITAM-containing adaptor proteins such as FcRγ, which then lead to the activation of nuclear factor kappa B (NF-κB) through Syk- and CARD9-dependent pathway. Dissecting CLR signal cascades and their effects on host immune cells is essential to understand the molecular mechanisms in regulating host antifungal immunity. Recently, the activated CLRs including Dectin-1 and Dectin-2 are reported to undergo lysome-mediated degradation by an E3 ubiquitin ligase CBL-b. Moreover, structural analysis will help understand the molecular mechanism of these CLRs and provide clues to rational design for effective anti-fungal drugs. Overall, we summarize the current knowledge on activating and inhibitory CLRs and discuss how to boost host immune system to fight against invasive fungal infection. C-type lectin receptors, cancer, fungal infection, HIV, organ transplantation, chemotherapy.